Whatever the event, we’ve got a menu that will tempt your taste buds. 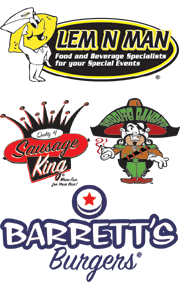 With burgers, fries, shakes, gourmet sausages, healthy Mexican food, Philly cheese steak sandwiches, barbeque chicken, tri-tip, fresh fruit smoothies, funnel cakes, fish & chips, wings, Award Winning Chili, Award Winning Tamales, and breakfast with coffee, there's something for everyone. But don’t take our word for it, check out what others are saying, or write a review of your own. We’re always looking for energetic, responsible people to join our team. So, if want an exciting job in a fun working environment, apply online. Check out our online calendar of upcoming events because WE GET AROUND!